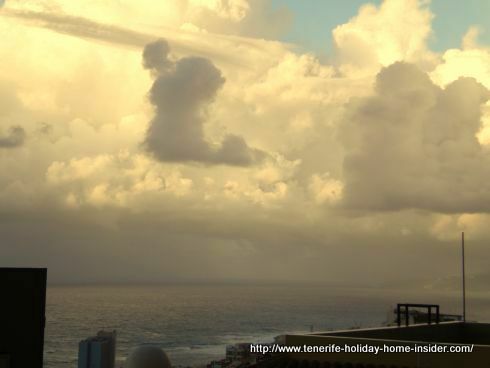 Understand Tenerife weather by its geographical locations. Tenerife weather all over the island. 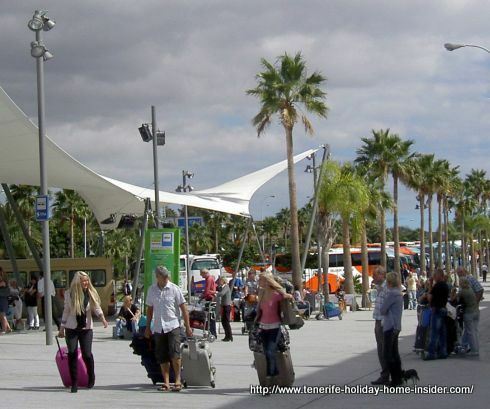 Tenerife weather at the south airport is usually experienced first. Rainy days are rare there. However, lets proceed with news about the island's weather of February 2016. 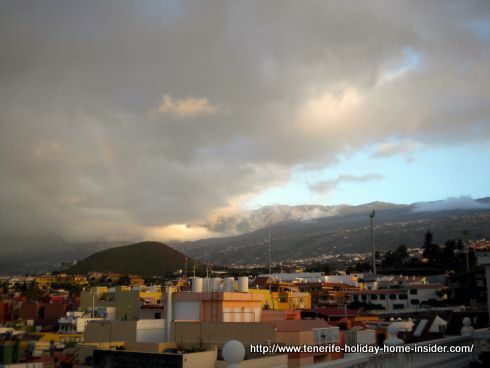 For ever changing skies in Tenerife North in the Orotava Valley were a sight to behold. It ended with a sunbathed Sunday on February 21. Before that there were sporadic torrential rains everywhere with much snow in the National Park that had to be closed to traffic. Occasional, but rather mild thunder occurred. Hail caused havoc on the TF5 by San Cristóbal de la Laguna. A brilliant white Mount Teide was finally framed by blue skies on Sunday February 21. Lately, it's often hard to say in summer if we see a so called gray Donkey Belly that's obscuring the sun or if it's the Calima dust clouds from the nearby Sahara of West Africa. 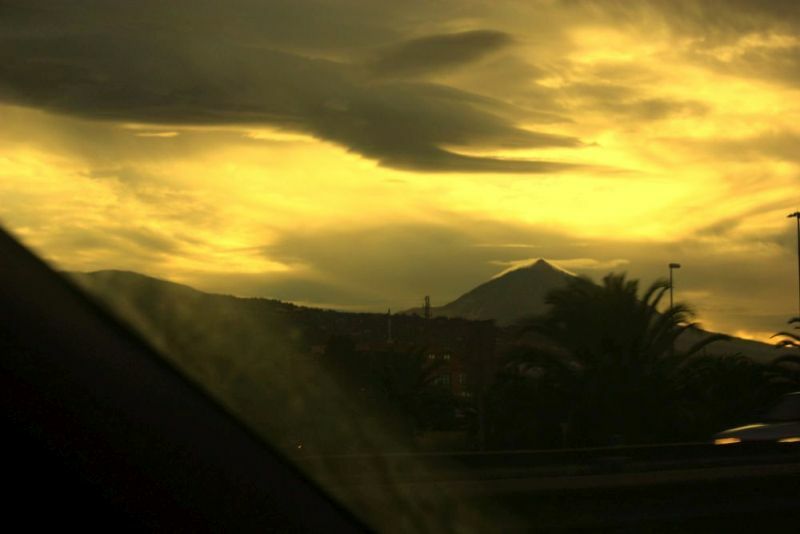 Cloudy sundown weather in Tenerife that embalms the soul. Nevertheless, there is nothing more beautiful than the clouds in the North of the Island. They embalm the soul. Weather clouds Puerto Cruz and shadows by Mount Teide. 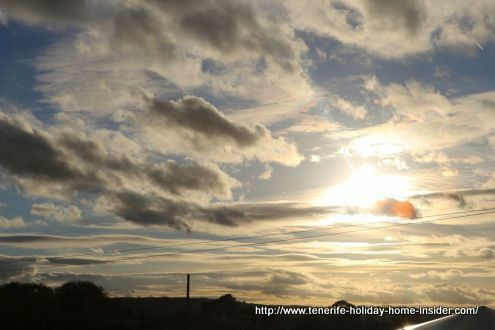 Weather forecasts for that area must never be taken for granted for the rest of North Tenerife. Do yourself a favor, enlarge and study the geographic location of Los Rodeos on this map... The airport is extremely exposed to wind and weather. You will understand, then. This is one reason why the world's most tragic aviation disaster happened there, before airport safety was improved. 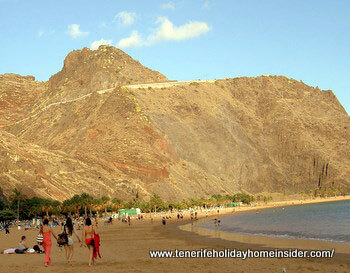 This part of Tenerife is not a typical area with holiday resorts. Mind the South of the island is usually two degrees warmer. 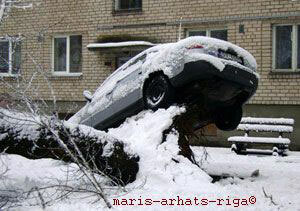 A car accident where a car was lifted by snow storm like shown in the Russian town Riga of the Ukraine wouldn't happen in Tenerife towns. However, a snow storm with bad Tenerife weather by Mount Teide may leave your car blocked by a falling tree, just as well. 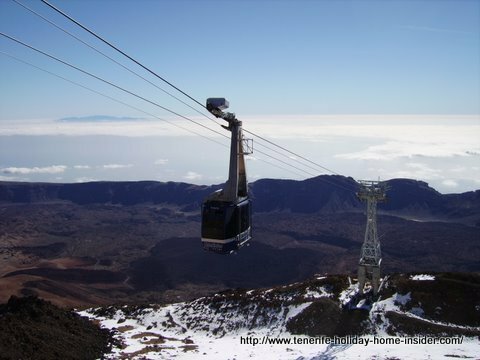 Needless to say, the Teide cable car will be working after storm and snow danger are over. You could find yourself stranded in the Cañadas because of strong winds. Therefor, they were off limits for about a week in February 2016. Then the Refugio backpacker hostel just below the last 800 meters below the Teide peak was snowed in. Minus 15 degrees Celsius may be expected when there is no sun. 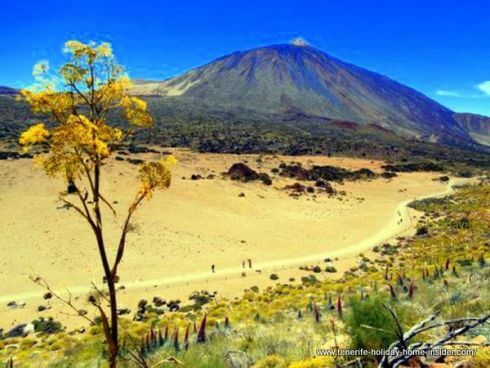 However, the Mount Teide weather in its Highlands called Cañadas is usually superb. Above all in Spring, as shown above, provided there was winter rain. 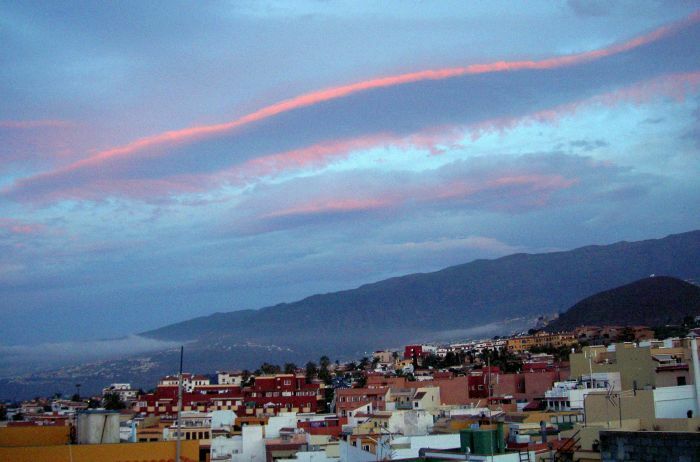 Clouds, normally cling like fog on mountain slopes, as shown on this typical Tenerife fog picture. 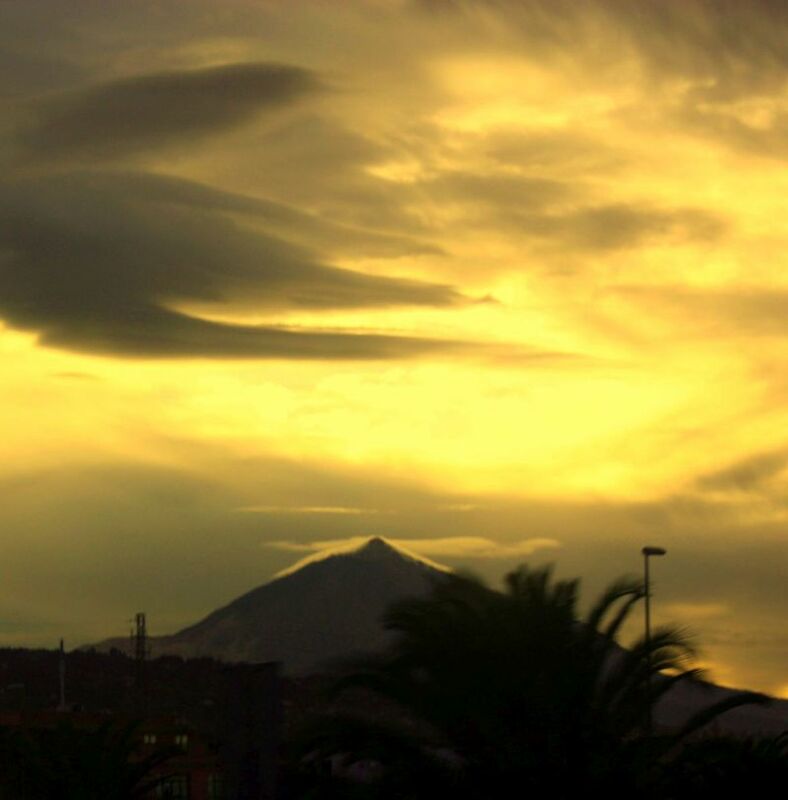 Photo was taken late afternoon by Agua Mansa which is ideal to watch this Tenerife weather phenomena. Agua Mansa is not more than half an hour's drive from La Orotava at about 1400 meters altitude to my best recollection. There is a temperature indicator on a high pole by the Puerto de la Cruz Titsa bus station. Whenever I am there during the day the temperature displayed is always around 24 degrees Celcius. Indeed, it feels so pleasantly warm there, whenever I look at it. Weather Santa Cruz with Playa Las Teresitas. 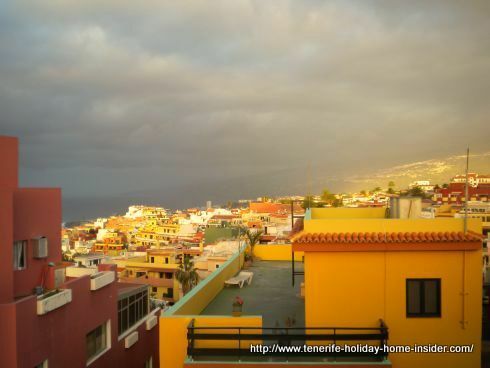 Observe the short distance between La Laguna Los Rodeos and Santa Cruz the island's capital. The latter faces East and partly to Africa but its weather is like that of the south. Even the winds which may be strongest on this big Santa Cruz de Tenerife beach. Adjoining San Andres has to endure some of the most inundating waves of the island. That's Playa de las Teresitas with the ancient Anaga mountain Massif. The occasional strong winds remind the dry Southern regions of El Medano. But without the surf, which is prevented by long jetties. Artificial air cooling and or at least fans are said to be priorities in the capital during the peak of summer. 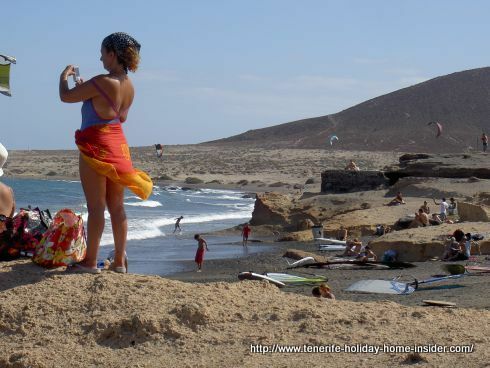 Look at the geographical conditions of the proper South of the island with Playa de las Las Americas, Los Cristianos, Adeje and windy El Medano. Windy El Medano surf paradise of Tenerife Island. Now, you'll understand why it's dry and about 2 Degrees Celsius warmer than the North in general. However the North and Nouth regions are only two reasons that remind a mini continent. 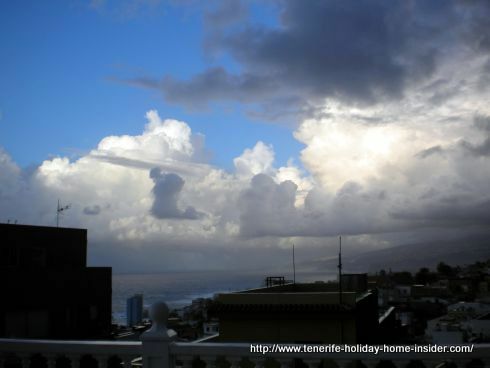 Gale force and other tropical winds of Tenerife weather. There is the saying that the strongest winds occur by El Medano in the very south of Tenerife, where surfing is at its best. However, the La Orotava Valley with Puerto de la Cruz and Los Realejos was visited by a whirlwind gale of 120km/hour for the 2nd time in 2010 within 5 years. Only Mount Teide was hit at 160km/hour during the February Cylone of Tenerife in 2010. However the deadliest Tenerife storm of all recorded times in the Canary Islands took place from November 6 of 1826 onward. It was the hurricane Bethencourt Gonzalez also called El Aluvion. 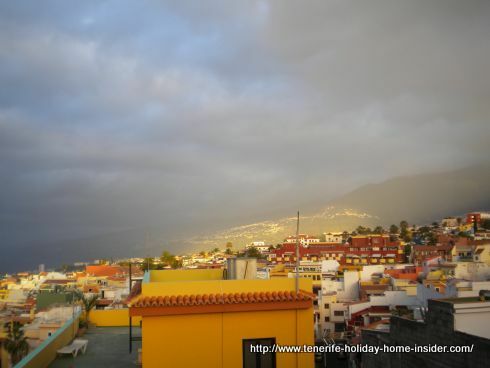 It hit the Orotava Valley in particular. Of course, roads have been improved since then, most houses are built better and weather forecasts are there to warn. Mankind shouldn't forget that meteorological conditions and nature are interlinked. Therefore, nature shouldn't be abused. Global warming is an issue everywhere despite the up and down weather cycles. 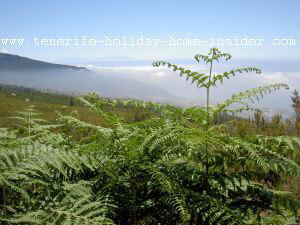 The biggest Canary Island Tenerife is so varied by its many mountains, ridges, gorges and valleys. The north is exposed to moist trade wind, contrary to the south. Meantime, the location, height, form and extension of mountains and its 'Corona' (belt) of forests nearby play a big role. But, the general rule for temperate all year round good weather and climate in its favored holiday locations is absolutely correct. By the way, the warmest weather on the whole island is in August, everywhere. Needless to say is that we want cooler conditions for a vacation for walking on the biggest Canary Island than for beach holidays. This is why Tenerife is ideal, as it caters for both. 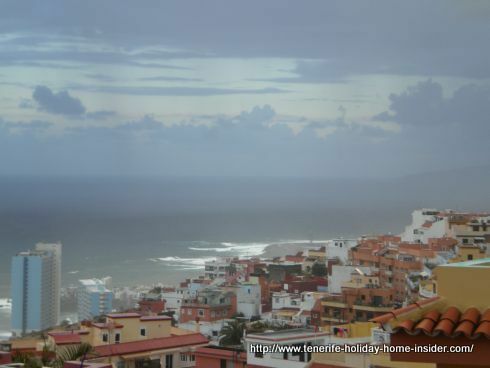 Please, return from Tenerife weather to climate in Tenerife where information on humidity and rainfall is included.